Thursday March 13th 1924 I packed my trunk in the forenoon and wrote to Joe Woolf. After dinner we went to town and out to the station to get my Pullman ticket. We went back after supper for the mail. The Pickens, Mrs Haines, Mr & Mrs Nutting, Mr [Kimhol?] & Mr Thomas here in evening. Friday March 14th 1924 I finished my packing and wrote Maurice Briggs. We had early dinner and Mrs Falk took me to the station. The train had changed time so did not get away till 3.30. When I reached Jacksonville I went directly to The Flagler Hotel. Had supper, wrote some and went to bed. 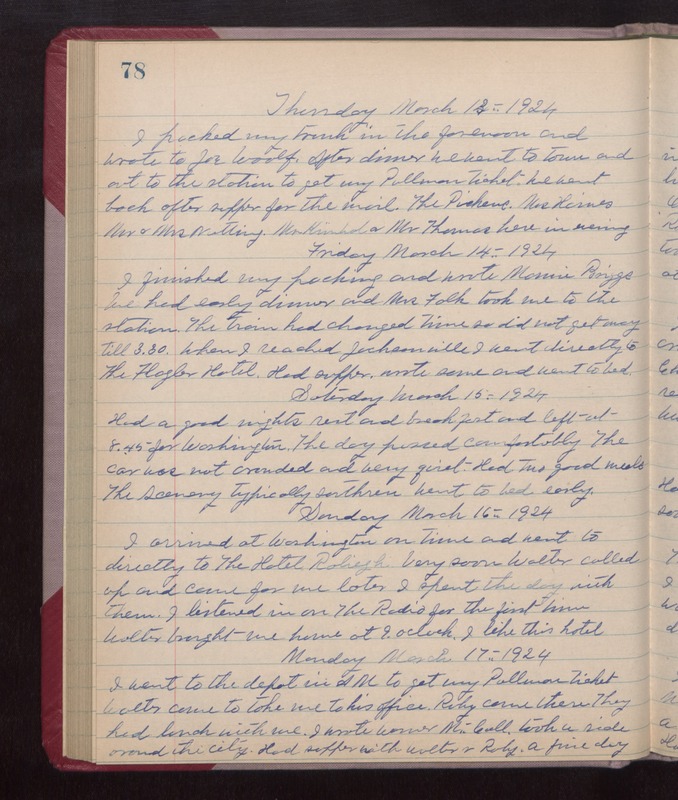 Saturday March 15th 1924 Had a good nights rest and breakfast and left at 8.45 for Washington. The day passed comfortably. The car was not crowded and very quiet. Had two good meals. The scenery typically southern. went to bed early. Sunday March 16th 1924 I arrived at Washington on time and went to directly to The Hotel Raleigh. Very soon Walter called up and came for me later. I spent the day with them. I listened in on The Radio for the first time. Walter brought me home at 9 oclock. I like this hotel. Monday March 17th 1924 I went to the depot in AM to get my Pullman ticket. Walter came to take me to his office. Ruby came there. They had lunch with me. I wrote Warner McCall, took a ride around the city. Had supper with Walter & Ruby. a fine day.